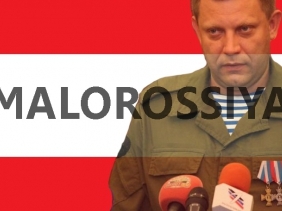 On 18.7.2017 the Head of the Donetsk People’s Republic, Alexander Zakharchenko, gave a declaration on the creation of a new federal state, Malorossiya, which will become the legal successor of ‘Ukraine’. The new state formation will consist of 19 regions of the former Ukraine with the capital in Donetsk city. Kiev remains a historical and cultural center without the status of the capital city. The project of the state of “Ukraine”, formulated one hundred and fifty years ago and implemented in different versions during the twentieth century, has reached its logical conclusion and led to the country’s disintegration, the civil war and the death of tens of thousands of people, including children, women, and elderly people. And this process is irreversible. An attempt to turn the story back will result in “balkanization” of the conflict, expansion of chaos, escalation of the civil war and even bigger number of casualties. – resulting from historical development and due to the Maidan, the word “Ukraine” is forever associated with the names of the Nazi accomplices Bandera and Shukhevich, with the tragedies of the Baby Yar, the Volyn massacre and Khatyn, and, nowadays, with mass murders of people on the Maidan, in the Trade Unions’ House in Odessa, and the Genocide of the Donbass people. On the basis of the above, we believe that the state of “Ukraine” in the form it was established after the collapse of the USSR is UNSERVICEABLE. We, representatives of the regions of the former “Ukraine”, propose to re-establish the state and to proclaim the state of MALOROSSIYA under historical background out of the former “Ukraine”. In this case, it is of fundamental importance to rename the country, since “Ukraine” as a state is guilty of war crimes, mass terror and genocide of its own people. In turn, the new name of the country based on historical traditions will enable us to reunify those pieces of the former “Ukraine” that seemed to have parted ways forever, including because of participation in the civil war on different sides of the front line. We must turn the page of our people’s history which is flooded with the blood of our brothers and sisters. Malorossiya is an INDEPENDENT, SOVEREIGN state with a new name, a new flag, a new constitution, a new state structure, new principles of social and economic development, and new historical prospectives. But this is NOT A REVOLUTION! This is a return to history. This is a novelty that restores, not destroys. In view of the economic plight of the country, the chaos and disintegration potential, regarding the possibility of launching a “war of all against all”, we consider it necessary to declare a state of emergency for the transition period – up to 3 years. During this time, the process of adoption of the new Constitution and the establishment of the rule of law should be completed. Under a state of emergency, a ban on the activities of political parties and foreign funds is to be introduced, and penalties for criminal offenses, especially against the person, are to be increased. The fight against corruption will be toughened, as well as penalties for it. The shadow arms market is to be eliminated, including by registering weapons in accordance with the new law. In the same period, an investigation is to be carried out with the involvement of foreign specialists – from Russia, Belarus, the European Union – into the crimes committed by the Maidan Kiev regime: murders on the Maidan, the murder of Odessa citizens in the Trade Unions’ House on May 2, 2014, war crimes in Donbass in the so-called ATO. In the same period, the People’s Tribunal is to be prepared to charge the state criminals who have led the country to disintegration and civil war: V.F. Yanukovich (with a request to Russia for his extradition), P.A. Poroshenko and his clique: Turchinov, Yatsenyuk, Kolomoisky, Paruby, Nalivaichenko and others. We are sure that, having recovered from the criminal neo-Nazi ideology of “Ukrainism”, we will be able to build a new society on the basis of friendship and mutual assistance, but not hatred and envy. The creative genius of our people will manage to bring Malorossiya to the forefront of global civilization and play a role in history. The role of Good and Truth.